The most frustrating aspect of what we do as auto writers is the boilerplate response we get from car companies when we ask about future cars. That wasn't the case with Infiniti CEO Johan De Nysschen, who essentially had this to say about the rumored Infiniti version of the Juke: "Hell yeah, it's ours, and it's going to be awesome." 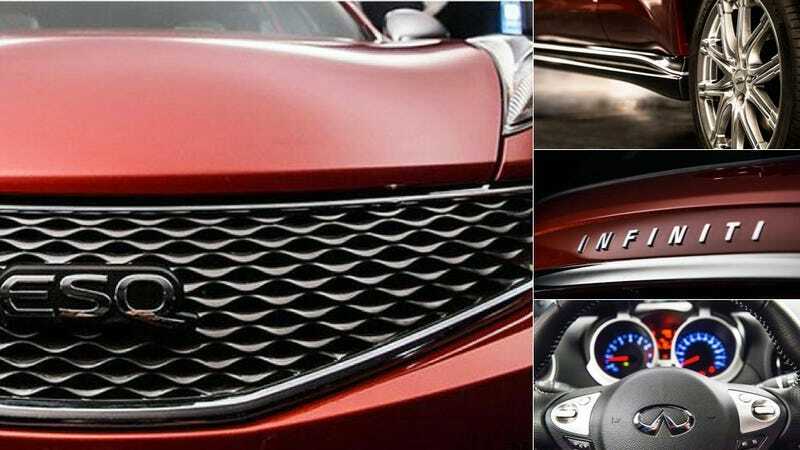 Here's the backstory: I was skeptical about the so-called Infiniti ESQ when I saw the teaser photos, so I asked an Infiniti spokesman about. I expected the standard reply: "We can't comment on future product." It's what we get nine times out of 10, but I have to try because it's my job. To my surprise, the spokesman confirmed the ESQ as a China-only luxury version of the Juke Nismo, which is a hellaciously fun small crossover. Then Matt wrote a post on Facebook that was a kind of shot in the dark, asking De Nysschen to serve up some more juicy details about the car. Contemplating a youth- oriented premium compact in our future. Many doubters including me. Want to test concept in China, biggest youth premium market. Juke not sold there . Creates opportunity. Irreverent lifestyle car for hedonistic rebel. Significant upgrades to NVH and dynamic characteristics. Volume will be restricted, so we can't afford sheetmetal changes. Car is fun, funky and a hoot to drive. Spanks an A1, so no apologies will be offered. Dislike cross- badging as much as anyone. Probably more. But China- only test marketing exercise before we sink a fortune into an untried concept. Life isn't always easy. The end. Emphasis mine. It's not only one of the most transparent answers we've ever seen from the CEO of a car company about a future car, it's also amazingly badass. De Nysschen doesn't like badge engineering — he realizes it never did Infiniti many favors — but he sees it as an interesting experiment. So get excited, irreverent hedonistic rebels of China. The Infiniti ESQ is here to help you spank A1s all day long.